Palo Alto’s 2018 Construction Dewatering Regulations Are Here! | Save Palo Alto's Groundwater! You can also access Palo Alto’s dewatering map directly on the City’s website and on our maps page. 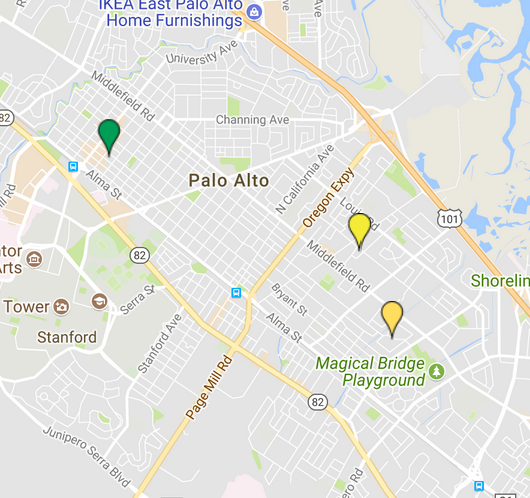 Palo Alto’s construction dewatering season started April 1st and, according to the map, there are no residential construction dewatering sites two months into the season. Can we hope that people have heard that California faces longer droughts and that we cannot afford to throw any water away? Can we hope that people realize it doesn’t make sense to build a basement where the water table is high and the chances of flooding during a winter storm are significant? Maybe some neighbors do realize this but just from looking at building permits for proposed buildings we know of at least six upcoming residential basements and several public and commercial projects with underground construction which will extend into the water table. No one loves ever more regulations but the City dismissed our short and commonsense proposal of “no construction dewatering where the water table is high” (as other regions with high water tables do). In the meantime the City is doing a creditable job of balancing competing interests by allowing dewatering and yet imposing some conditions to reduce waste of groundwater and impacts to property, vegetation and infrastructure. Palo Alto’s 2018 dewatering ordinance reduces the amount of groundwater pumped and discharged into the storm drain by encouraging the use of cut-off walls, incorporating financial incentives to limit construction dewatering to a total of 8 weeks and requiring continuous construction once dewatering starts. It reduces impacts to property, infrastructure and natural environment by requiring on site monitoring throughout the construction period of groundwater level and of pumping rates and amount of water discharged and by requiring a land survey and marking of land elevations of structures on adjacent parcels. Still, there’s room for improvement. We believe the current ordinance can be enhanced by identifying or prescribing best dewatering practices as well as by providing objective dewatering metrics for builders. Additionally, this ordinance lacks specific guidance for groundwater pumping in areas over or near toxic plumes or for dewatering projects where the dewatering covers a large area (>10,000 ft2). Ideally, the City could require cut-off walls for large dewatering projects such as the Marriott Hotels at San Antonio Road and for construction dewatering over or near toxic plumes. Our concern, shared by the City, is that cut-off walls could change/impede the post-construction flow of the underground streams and lead to flooding or other unintended consequences. The City decided that a CEQA (California Environmental Quality Act) study is needed to determine if there are increased environmental impacts from using cut-off walls and, if so, if these impacts can be avoided or mitigated. We are hopeful the City will do this study by late fall. With your help and support some of our concerns – waste of groundwater and damage to property – are being addressed if not yet fully mitigated. All water is valuable and our homes, modest or grand, are our castles. We request your continued involvement and support and will keep sending periodic updates. Please contact us with any comments, questions or suggestions at info@savepaloaltosgroundwater.org.